If less is more is more to your liking when it comes to design, then you are in for a treat. Today on homify 360°, we encounter a minimalist structure that is a few clean spaces, a few linear touches, some light and tranquil colours, and a whole lot of style. 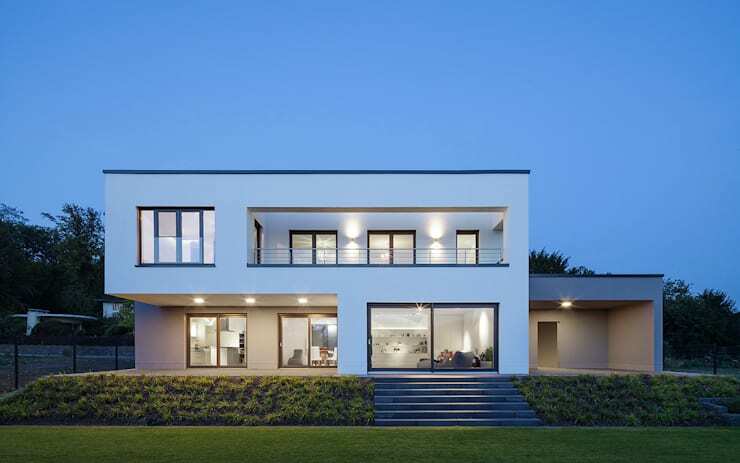 After receiving the design brief from their clients, an architectural firm immediately got to work and conjured up a minimalist creation that not only looks fantastic, but also makes for a perfect setting for the family’s flourishing lifestyle. 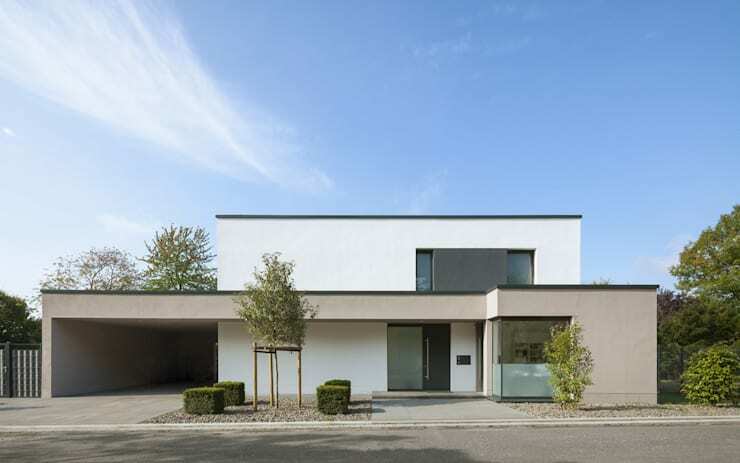 With a very straightforward and almost stacked-like appearance, the house’s exterior facade is just what the clients ordered: clean and calm. It would appear that the simple design and appearance have been inspired by the iconic modernist style from the 1950s and 60s, adding a delightful throwback to the golden days of architectural wonders. To interrupt the combination of clean surfaces and neutral tones, a scattering of trees and plants adorn the front side ever so slightly. Maintaining the same straightforward look as the front, the rear side opts for significantly more glass to present a more open and welcoming appearance. And with a spaciously stretched-out lawn as seen above, who wouldn’t want to make optimum use of it? An intermingling of cubic volumes creates numerous cuts and recesses, resulting in a stylish mix of balconies and terraces, which present even more opportunity for a relaxing sit-down to enjoy that stylish landscape. 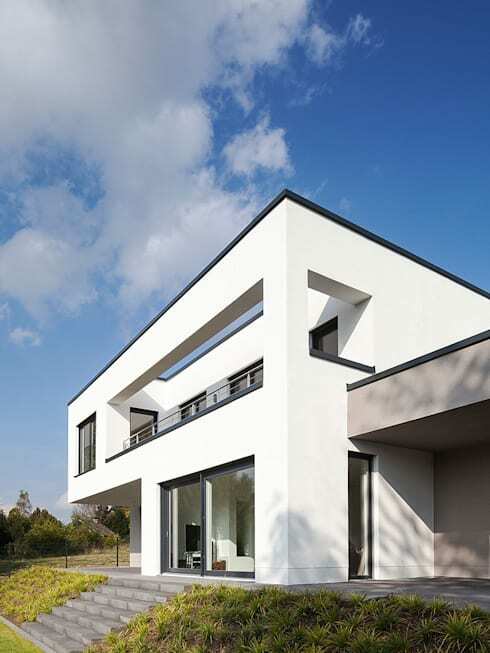 Because of the various surfaces and expertly created detail, the house’s facade offers up exciting looks regardless of which side you view it from. Notice how beautifully the structure’s linear design contrasts with the organic look of the adjacent garden, making that man-made structure appear even more elegant and flawless. Similar to the exterior surfaces, the interiors opt for a mostly white look that adds in the house’s clean and glamorous appearance. This makes the interior spaces glow with perfection, although the amount of glass doors and windows also certainly has something to do with it. 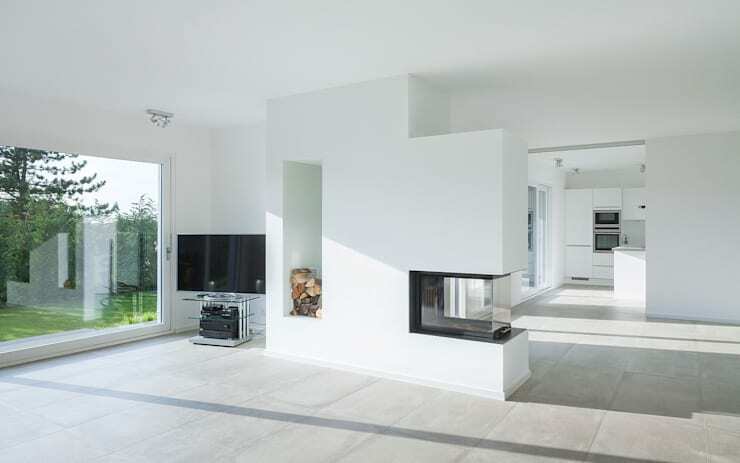 And since sharing is caring, that spacious open-plan layout gets to share in the warm and cosy ambience of that ultra modern fireplace, designed to heat up any surrounding surface. 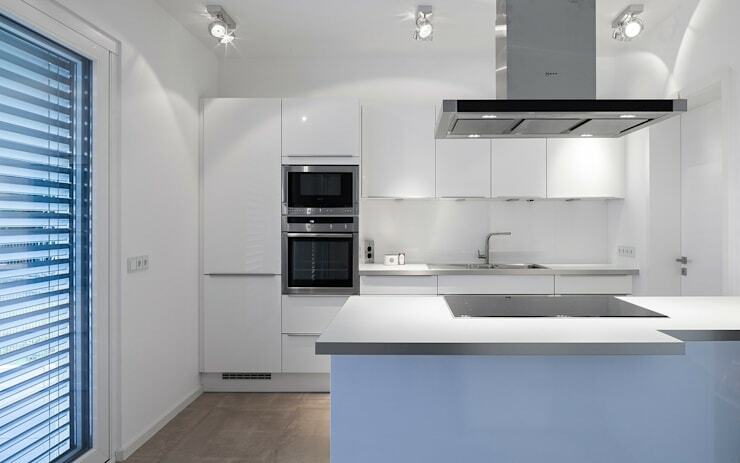 By now our architects and designers have definitely realised that there’s a winning recipe in using an abundance of white surfaces, which is why the kitchen also flaunts a decadent dose of pale tones. Just see how the glossy finish of the cabinetry makes the reflective lighting bounce around the room. This is not an accident; because this section of the house has a rather limited source of natural light, the kitchen has been outfitted with a variety of lighting types to help light up the space as and when needed. The en-suite bathroom stylishly continues the neutral colour palette, breaking up the whites ever so subtly with an introduction of earthy brown for the floor and select wall areas. 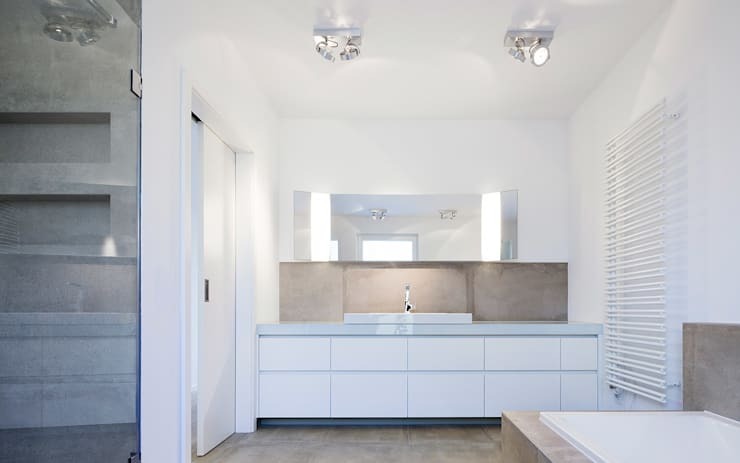 Taking its cue from the kitchen, the bathroom also makes use of elements to make the artificial light dance around for a more lit-up vision; in this case, the mirror. Clean, calm, and most striking, this house looks more like an art display than a residence intended for a family – definitely a thumbs up from us! Don’t miss these: 7 Minimalist Interiors that WOW! We think it’s absolutely stunning, but would rather hear your thoughts on this house. Share them with us in our comments section below.